The video below covers a review of World Cup group A which will be useful in determining Asian handicap bets on early matches in that group. For other similar videos covering other World Cup groups there are a handful more on Youtube. And on Youtube you can find a series of videos specifically focused on asian handicap betting too. Here's the link to the official FIFA World Cup website. Famous English newspaper The Guardian has a useful section on World Cup 2014 news and updates. This will be valuable for team news in the run up to the first matches. Finally don't forget the usual leading social network sites. Both Facebook and Twitter will be inundated with posts and tweets related to World Cup Asian handicap betting. Either of these will offer valuable ways to keep up to date on what's happening on the betting front. In addition to handicap odds and the 'standard' decimal odds, there are other types recognised in the Asia region - they vary slightly for Malaysia, Indonesia, and Hong Kong. Of course it doesn't matter what you play, the payouts are the same. However you do need to know what you're betting for, and what you're going to win with your bet. So let's take a brief look at some of the types of Asian odds. I don't need to explain decimal, so we'll focus on Malay, Indonesian, and Hong Kong using some examples to illustrate. You'll see these stated as a negative or positive number which is never bigger than 1, with negative meaning the underdog, and positive indicating the favorite. This is essentially the same as you'll see in American markets where 3 or more figures are used, though for Indonesia these are displayed as 1 digit followed by a decimal point. Any Good Alternatives To Asian Handicap Betting? We've already seen that Asian odds will give you just about the best chance you can get of successfully landing some bets on the World Cup matches. Of course, handicaps are not the only way to bet. The bookies will be offering thousands of different markets on games throughout the tournament. All of our recommended bookmakers can also be used for placing other types of bets, ranging from straight win/lose/draw wagers on matches through to number of corners, goal kicks, penalties, both teams to score etc. You name it, someone will be offering odds on it. Perhaps one of the most interesting though is in spread betting. With this you'll also be seeing markets from anything like total numbers on the back of goalscorer's shirts through to number of penalties converted or the total number of goals in the entire tournament. Spread betting can be volatile. You can win a lot of money, and you can lose a lot. If you're interested then I'd advise caution....maybe only use it to play up some winnings from any successful Asian handicap wagers. Sporting Index is the place to go for the widest range of spread betting markets. New Customers get £500 in free bets. • What is Asian handicap betting? • Why use Asian handicap betting for the world cup? How Do I Choose Which Bookmaker To Place My Bets At? Previous experience has shown there are some online bookmakers that are significantly better than others for World cup Asian handicap betting, both in their reliability, safety and most importantly - their ability to provide the best odds. Bet365 (visit website) - Bet365 is undoubtedly the best bookmaker for UK and European betters due to its size, fantastic reputation and ability to provide some of the best Asian handicap odds. For the latest betting offers visit the World Cup promotions page, or get other recommendations at our best Asian handicap bookmakers for UK and Europeans section above. 188bet (visit website) - 188bet is one of the most reputable Asian bookmakers around and also has some of the best Asian handicap odds. What makes 188bet particularly appealing for Asian players is that it allows accounts to be held in a wide arrange of currencies, including Indonesian Rupiah (IDR) and Malaysian Ringgit (MYR). In addition, 188 bet allows deposits to be easily facilitated through players’ local bank accounts. For more info on 188's current betting offers see the 188 World cup promotions page or get other recommendations at the best Asian handicap bookmaker for Asian countries section. To the untrained eye, Asian handicap betting (previously known as ‘hang cheng betting’ in Asia) can seem quite complicated and confusing. Luckily this is not the case, as many World Cup fans will find out. Essentially, instead of providing three different betting outcomes for a sports match (i.e., win/lose/draw), Asian handicap betting reduces this to two options: win or lose. The betting method is typically applied to football matches as football is one of the most popular sports where a draw is a regular occurrence. The draw outcome is removed by applying a ‘handicap’ to one of the football teams. The football team that is perceived to be weaker team is given a handicap of goals, ranging from one quarter of a goal to multiple goals. The idea is to create a situation where the odds of either result are as close to 50/50 as possible - this is best explained through a number of examples in the following section. However, if you are looking for a in-depth explanation then check out our page on ‘what is Asian handicap betting?’. Let’s explore an example of World cup Asian handicap betting to get a better feel for the betting method. In this example, England are seen as the underdog and have been given at +1 goal handicap, while Brazil has been given a -1 goal handicap i.e. a 1 goal handicap is applied to the game. Essentially this means that the score at the start of the match is England 1-0 Brazil. • If Brazil win by 2 or more goals then we win the bet e.g. If Brazil score three goals and England score a single goal, the final score would be 3-1 to Brazil and the effective handicap score would be Brazil 3 - 2 England. • If Brazil win by 1 goal then the bet is returned e.g., If Brazil score one goal and England do not score, the final match score would be 1-0 while the effective handicap score would be Brazil 1 - 1 England. • If Brazil draw or lose then the bet is lost e.g., If both Brazil and England do not score, the final match score would be 0-0 while the effective handicap score would be Brazil 0 - 1 England. This is an example of full-goal handicaps. It is also possible to get quarter and half goal handicaps which again are covered in the Asian handicap betting explained page. Why Use Asian Handicap Betting When Betting On The World Cup? The answer is quite simple: the big benefit of Asian handicaps is that instead of having to place bets where the odds are low and you have to stake large sums to win a small amount of money (e.g., bet £200 to win £20), you can place bets on simple outcomes (i.e., win or lose) on the same match or team and get much better returns. In addition, you will generally get significantly better odds on Asian handicap betting than standard betting because the best bookmakers specifically aim for low returns in their profit margins (normally around 2-3%). They do this in-order to remain competitive with the large amount of competitors, particularly in Asia. Therefore, once you understand the basic concepts of Asian handicap betting, you will agree that it is probably the best betting option for the 2014 World cup. To get the best deals from any form of betting you need to know which bookmaker or sportsbook is offering the best odds. Why leave money on the table by taking worse odds with one bookie than you could get with another? Odds wilI change all the time in the lead up to a match, and of course if you're betting in-play they'll be changing during it too. So it's not going to be practical to list all the different odds on offer here. Fortunately there are plenty of places to compare and get up to date Asian handicap odds. You can of course go direct to the bookies themselves, but the best solution is one of the sites which compare live stream odds. I'll be listing the best of them right here when we get closer to the first matches. The World Cup qualifiers, groups, and teams are known. No doubt the managers of each national team know who is going to be lining up for their starting games. But each match will best be analyzed on the day to take into account any team or environment changes, how well each team are performing as the tournament progresses, and of course what the handicap odds are on offer. This section is reserved for tips on the matches and teams where the best value Asian handicap odds are available, and where you can get them. Check back regularly for daily updates where we'll be determining the most lucrative betting opportunities. The Group stages are a tricky time for any team, even the most fancied. The most important thing for any side is to avoid elimination, and that sometimes makes for nervous performances. For the canny punter, the Group stages can offer some fantastic value Asian odds opportunities. This is particularly true where victory by a good margin (or even holding an opponent to a low number of goals) is of the utmost importance. You'll also need to consider other aspects of how a game might unfold. An example might be that if a team goes one goal up, it may encourage their opponents to take more risks through the rest of the game resulting in a potentially higher score - more likely in favour of the heavy favourites. These types of aspects - whether the Golden Boot might have an affect is another to consider - might be particularly useful to take into account if you're monitoring your handicap bet in running/play. It's also worth noting that underdogs can play above themselves in the early rounds. There are plenty of examples of this in previous World Cups where highly fancied teams have been held to reduced margin victories or even in some cases draws or losses to lesser opponents. On the day of the matches I'll be posting links to information here which will help in making any handicap selections for those games. There are a number of expert resources which have already been covering the games in depth, in fact thousands, but for me there is no rival to the excellent online sports magazine Betinsight.co.uk for a truly great source of match write ups and predictions. You can read full match previews with expert analysis of both sides in each game, predictions on how the games will unfold, and an in depth betting preview analysis determining which types of bets offer best value at the excellent Betinsight World Cup match previews section. If you're betting in reasonably small sums of money then you won't need to be worrying too much about the difference in Asian odds at different bookies. Most of the major bookies offering AH odds are going to have them set fairly similarly, and for small wagers on any World Cup match it's not going to make a great difference to your profit margin by shopping around. But if you're betting with larger sums or on a regular basis, you'll want to be looking for the best odds you can get - a small difference in odds can make a big difference in profit on larger bets. To achieve this it's critical to be using an Asian odds or AH comparison tool. These are tools which list all matches and compare each handicap with the odds on offer against it and for both teams, and they're updated in real time. AH odds fluctuate all the time depending on the weight of money for any specific outcome, and they can fluctuate wildly. Finding a good Asian handicap comparison tool which shows all the World Cup matches in an easy to understand format is not as easy as it sounds. Most I've looked at are complicated to use and not very pretty/user friendly. So what's a good one? Take a look at the image below which shows the best AH odds comparison chart I've found. This is an example section of a table from the tool which shows the odds for the Columbia v Greece game. You'll notice that it lists the goals handicaps in the left hand column, and moving across shows the odds for that handicap on the home team (1) and the away team (2). Of course neither are home or away but I'm sure you know what I mean. You can then click on 'compare odds' and a dropdown will open which shows bookies current offers. This tool can be found at Oddsportal.com and it is the best comparison tool for Asian odds in World Cup matches that I've found, just click on the image to see the rest of the comparison table for this and other games. With Asian handicap odds you get higher returns than fixed odds, the draw won't worry you, you back your favorite team to win if they're the heavy underdog, and keep in the action as odds change through the game. What can be better than watching your country's team battle for glory with a small side bet running on the result? And what better way to do that than using the betting method that's steadily becoming one of the most popular - betting with Asian handicaps. So what do you do if placing handicap bets on the World Cup is not for you? Or even any other form of bets on the matches themselves. Maybe you're looking for something entirely different. Maybe you're in between games, you've already placed your Asian handicap bet, and you want something to pass some time and have some fun outside of football and the World Cup. If that's the case, you might want to take a look at the range of current casino promotions with a World Cup bias. Almost all bookmakers offer Asian odds, though some will be more valuable for you to work with than others. To get your handicap bet down you're going to need to know which bookies offer this type of bet in your region. Not surprisingly, with the wide variation in betting regulations from country to country, the number of bookies available to you is going to vary wildly depending on where you live. If you're in a Malaysian resident there's a page dedicated to football betting in Malaysia. This lengthy section aims to provide an unbiased analysis of the best online bookmakers to use when placing Asian handicap bets on the football World Cup. If you are looking to skip all the content and get straight down to betting then just below are my recommendations for which bookies, bookmakers, and sportsbooks are going to be offering you the highest odds, the widest range of markets, the simplest deposit and withdrawal options, and maybe even the odd valuable bonus or special promotion thrown in on top. Before we get to the bookies, a quick word about the matches. Whether you're looking for best asian odds and tips/predictions on matches involving Australia, Argentina, Brazil, England, Germany, Spain, the US (or anyone in between!) there's a section below dedicated to the games of the day. In this section I'll be publishing links to well written overviews of the games, and occasionally making my own write up to pinpoint where the asian handicap value lies. The operators above are widely recognised as the best for each region of the world. It's worth noting though that for the UK and Europe, although there are some big names who cater for punters with great products and worthwhile promotions, it's definitely worth considering the Asian region bookies many of whom do also serve UK and European Customers. If you are from the UK, you may well want to stick with the names you know. There are a wide number of operators to choose from, most of which are highly regarded and have been in business for many many years. Some of these European focused bookmakers also have a more global presence and are open to Asia region bettors too. You'll see they appear in the lists under multiple regions. Aside from those above others include Bet-At-Home, VCbet, Coral, Skybet, William Hill, Blue Square, Boylesports. Note that for US or North American residents the options are fairly cut and dried - you're limited to a handful of sportsbooks which although low in number are highly regarded and trusted. In addition to the top three in the list the others include Sportsbetting.ag, Pinnacle Sports and 5Dimes. Australian punters are well know for their betting activities, and you'll find that the Aussies among you looking to place World cup Asian handicap bets will have your own handful of betting operators that focus solely on Australia. 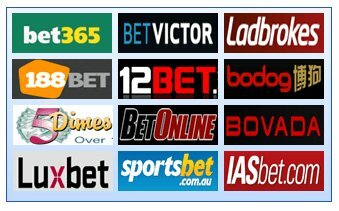 Sportsbet.com.au, Sportingbet, Luxbet, and IASbet are all options for Aussie punters that haven't made the top sites list, but still offer good alternatives. Which brings us to Asia, and the region where it all began. Punters in Asia are spoilt for choice, with a number of bookies fighting each other to offer reduced margin odds and capture as much of the local business as they can. If you want an Asia bookie for England v Italy, Uruguay v Costa Rica, or Columbia v Greece they'll all be offering AH odds. The soccer World Cup of 2014 delivered goals galore and some exciting clashes between old rivals, with the cream of today's highly skilled footballer's demonstrating their abilities. We had some great chances to get in the thick of the action by betting on World Cup Asian handicaps, where the only result that really counts is win or lose. Bet365.com (www.bet365.com) is one of the worlds leading bookies offering every type of bet you'd want, live in-play betting, and a range of bonuses and promotion. They are simply the #1 choice for betting online from Asia. Of course, placing these types of bets on World Cup matches is not the only way to bet on your favourite teams or add a little extra spice to matches you're watching, but as we saw on the page dedicated to Asian handicap betting they do offer some great advantages. So if you want to spice up your viewing of any World Cup match with an Asian handicap bet on the outcome, probably the first step is to understand what this form of betting is all about and how it works. This video tutorial above from SBObet offers a great starting point. .....We're now on course for what promises to be one of the most bet on sporting events ever - the 2018 Football World Cup in Russia - and there are going to be plenty of asian handicap betting opportunities right here from the start of the first match of the tournament between Russia and Saudi Arabia on June 14th.